777-JUNK is everywhere you need us at everytime you want us! 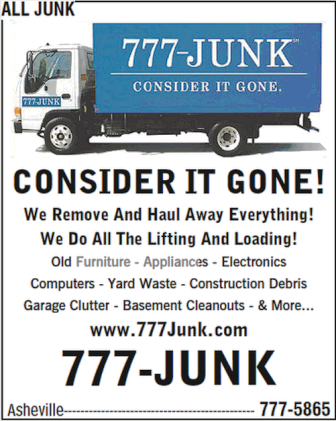 You can find 777-JUNK in the Asheville Real Yellow Pages from AT&T. Although you’re here on the Internet reading our post, you never know when you may be at home and reach for the Asheville Real Yellow Pages and need to find our junk removal services. By the way, junk removal and junk hauling services are located under the “Garbage Removal” section of the Real Yellow Pages. If you need our junk removal services now, please visit our Online Appointment Scheduler here. And if you need to get a quick Price Estimate, use our Online Price Estimator here. We look forward to serving you from the Internet, your mobile phone or your home phone and the Asheville Real Yellow Pages!